Patrick Halpenny recently asked me if I could write a bit more about trotters, particularly the ones in the upcoming NZ yearling sales. Patrick’s involvement in trotting was covered in an article in Harnessed magazine in the October 2014 issue – like me, he comes from a background with no connections to harness racing and only got hooked by going to watch “the trots”. Unlike me, he’s young (26) and that’s a rarity in the breeding ranks these days and really welcome. He’s doing all the right things – driven by passion but learning from experience and getting good advice as well as doing his own studying. Patrick goes under the moniker of Go Harness Racing Ltd, which should not be confused with Noel Kennard’s GoHarness syndication business. Standing Bear, a yearling colt by The Pres from Flashman, is Patrick’s first entry in the yearling sales. He will go into that arena knowing how hard it can be for sellers. Patrick explains the background to Standing Bear: he has a syndicated share in the sire and was looking for a mare to use the service for. He first saw Flashman racing up north on lease and enquired if there was a buy option on her, only to find out the she was owned by friends if his. 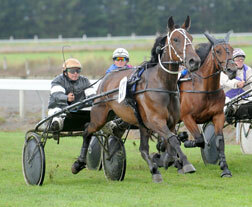 Flashman, big strong trotting mare, winning at Banks Peninsula in 2009.
finer, nice head and calm presence. 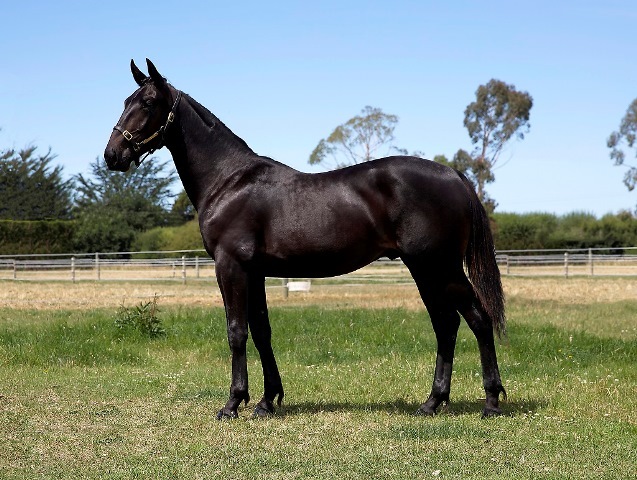 Flashman is by Continentalman from a Gee Whiz II mare – that’s the same cross as Dutch Annie. Continentalman has done a workmanlike job as a sire, particularly facing the job of having to make his own mark as an unraced sire, but his breeding was solid and his dam was the wonderful trotting mare Continentalvictory who won $1.6million and had a full brother Victory Abroad who won half a million plus. So linking back to the Valley Victory factor (The Pres’ dam is the US 3yo Filly Of The Year Southwind Allaire who is by Valley Victory) makes a lot of sense. Just a quick aside about Valley Victory – his dam is a half to Wall Street Banker, the trotting sire who was available here for a couple of years in the early part of this century, for just 13 live foals (6 starters, 4 winners) and only two of his mares are breeding on so far but neither have yet been to the many sires now available with Valley Victory strongly in their maternal lines. The Pres has oldest progeny at 3yos now – there’s just over 30 of them and only 3 winners to date, with the flag bearer being Primz Luck from the good producer Howz Lucky. He was exported to Australia mid last year and not sighted since. So The Pres really needs to get some more winners showing up about, well, now. 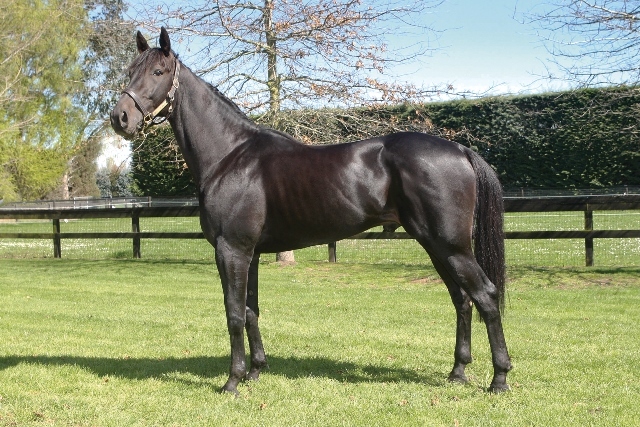 He has 9 yearlings in the yearling sale at Christchurch, all except one are colts. He has just one representative – a filly – in the Karaka sale, and that is Primz Luck’s full sister so should attract plenty of attention. The filly in Christchurch’s sale is Lot 353 Midnight Memories from the dam of Bonechip. Back to Standing Bear – love the name, Patrick – and it’s time to have a look at him and see if Patrick’s plan to add a bit of length and fineness to the mare has worked. Looking at the photo of Standing Bear, I’d say yes. He’s a striking looking type and his body shape looks a lot like his dad’s. He should sell well on type alone. He’s from a 6-win mare, and a maternal family that (if you skip one generation) is full of solid winners including good juvenile trotter Flame Up. All the best with your yearling, Patrick, and your future breeding ventures! Next blog I’ll look at a very different trotting colt who blends American, French and Swedish breeding.